WAS THE CARTEL ‘METH BOSS’ JAIME HERRERA ARRESTED? 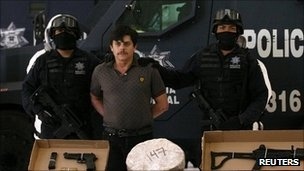 Mexican police say they’ve captured one of the country’s main producers of the illegal synthetic drug methamphetamine. The suspect Jaime Herrera was detained in Culiacan in Sinaloa state along with an alleged accomplice. He’s alleged to have close links to Mexico’s most wanted trafficker, the fugitive Sinaloa cartel leader Joaquin “El Chapo” Guzman.